A classic experience in Patagonia is a visit to an authentic cattle ranch and homestead, known as estancias in Spanish. Even better than a short visit? Spend a few days there. Immersed in the deep hospitality of a Patagonian ranch, you’ll sample moments of day-to-day rural life. Gaucho (cowboy) history and culture lives on today, complete with livestock wrangling and traditional-style barbeque dinners. Cerro Guido is the largest active estancia in the Chilean Patagonia, measuring 107,000 hectares (264,000 acres). Depending on the time of the year you can watch traditional livestock roundups, living a day in the life of a real gaucho, atop a horse and accompanied by a trusty shepherd dog. The tranquility and the views from the estancias are unbeatable. Sierra Baguales, which is a little-known mountain range outside Torres del Paine National Park, is just 26 km (16 miles) away. As a small hotel with only 15 rooms, Cerro Guido is an intimate retreat from the high season crowds of the national park. The rooms are comfortable and basic, preserving the style of the pioneer era. Simple wooden English-style architecture reflects the origins of the former administrators. Warm bedding, central heating and the surrounding silence give will ensure a restful retreat. Be prepared to embrace the rustic side of rural living. Wi-Fi is only available in the reception and the internet is quite slow. The light is cut at midnight and goes back on at 7:00am, according to the power generator’s schedule. Dining here is more on the side of gaucho than gourmet, without major pretense. You’ll find unassuming Chilean staple dishes. The prize on the menu is a lamb barbecue, fired up for groups of eight or more people. Aside from that, you’ll be served up different dishes of locally raised lamb and beef. Sides of potatoes and vegetables come from the greenhouse and farm, complementing a healthy, organic, and locally sourced plate. The exclusive house wines come from the Estancia owners’ organic vineyard. Or opt for a variety of prestigious wines from all over Chile. 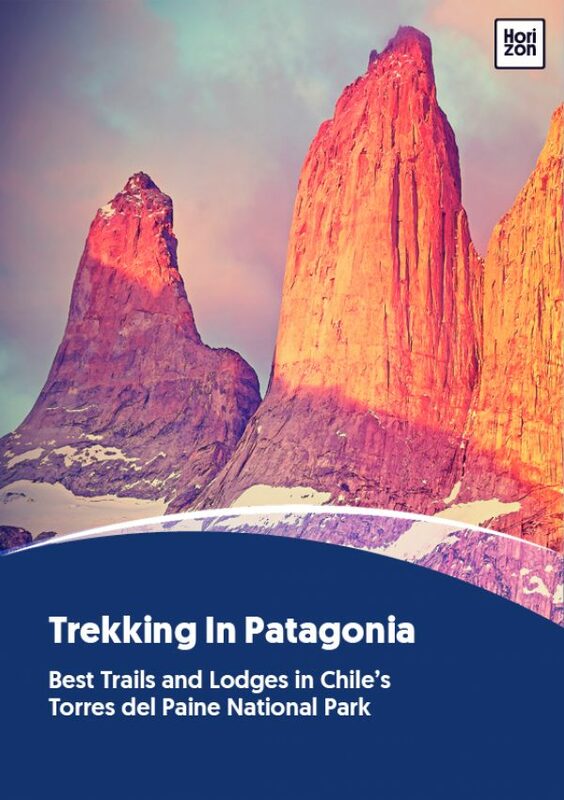 The classic excursions from Cerro Guido are day trips to Torres del Paine National Park. The ranch can arrange the most popular day hikes, such as Paso Los Cuernos and Torres Base Hike. Alternatively trekkers can venture to the summit of Cerro Guido to visit the "Chenke" indigenous cemetery. Of moderate difficulty, the route ascends along a valley following the course of a stream until arriving at the foot of the cerro (hill). Work your way upward until a panoramic view opens up from the summit, taking in both the Paine and the Sierra Baguales peaks. Duration: 4-5 hours. The Sierra Baguales region owes its name to the wild horses that still roam there. It’s a 26 km (16 mile) drive from the ranch along a gravel road, opening up to colorful basalt formations. The natives Tehuelches or Aónikenk called it carhuern, which means "very old", believing that evil spirits and monstrous quadrupeds inhabited these wild lands. It’s worthwhile to persist all the way to the route’s end, where the Estancia Las Cumbres is located. Here you can take a guided tour and learn more about the history of the mountains. The surrounding area is perfectly suited for horseback riding, with routes ranging from two hours to full-day trips. Good saddles and helmets are provided, along with a gaucho with local knowledge and some lively stories to tell.